I've written about surfboard storage before, but I’ve never seen anything as eye-catching as the surf shelves from Kauai Swan. This one is the Sentinel, which comes in sizes for two, three, four or five boards. 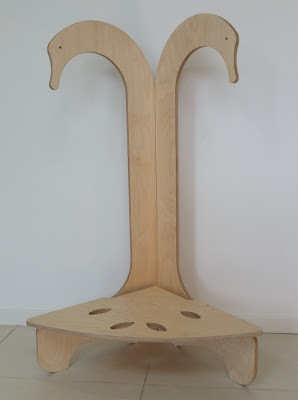 And this design is called the Cygnet; it was designed specifically for corner space storage. The products are shipped in a flat-pack; they are assembled with just a Phillips screwdriver. You can contact Kauai Swan about delivery outside the Sydney area, including overseas delivery. 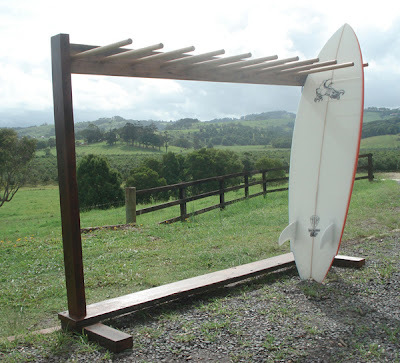 If you'd prefer to keep the racks stored horizontally, take a look at Byron Bay Board Racks, such as this wedge rack for seven boards. 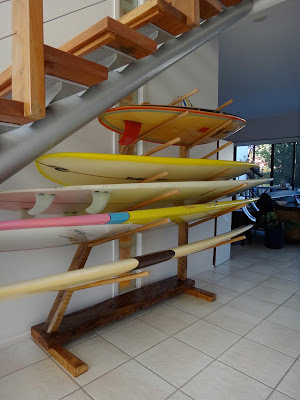 All of these racks are made from “recycled Australian hardwoods, including iron bark, yellow box, Australian cedar and red gum to name just a few.” The wood comes from old houses, barns, decks, fences, etc. 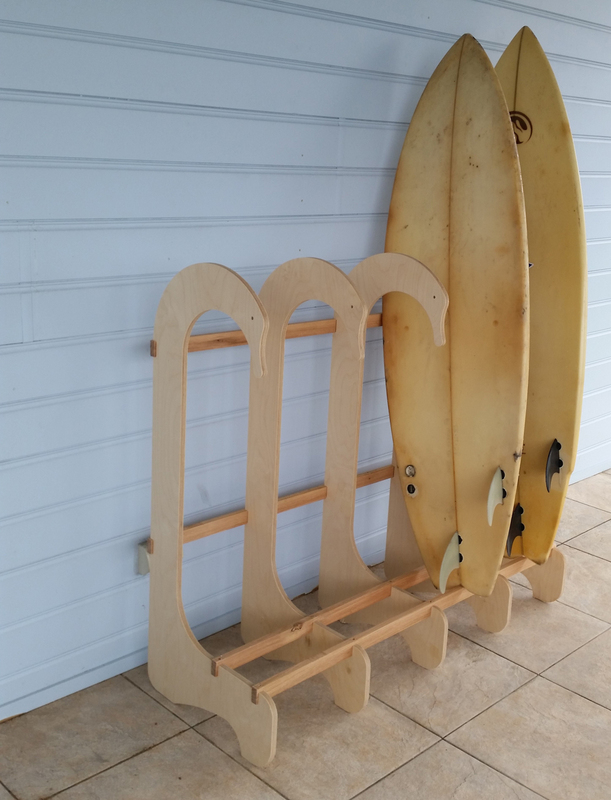 The company also has a vertical rack, available in various sizes. You can get a protective floor mat to go with this rack, made from recycled tires. The Byron Bay racks are shipped fully assembled. The company does not ship outside of Australia. If you don’t mind a bit of obscenity, and you want a quick read to inspire your decluttering, this might be the book for you. It only has 16 pages of content, in large type; you can read it in 10 minutes or so. And the ebook version is free! Chris Thomas, a designer, doesn’t provide any gentle handholding here. 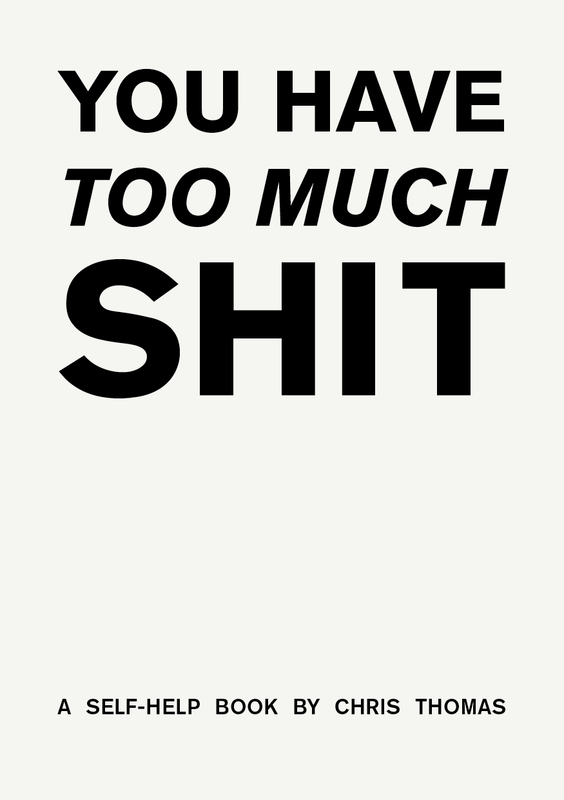 Rather, this is more of a manifesto for those who own lots of stuff: identify the useless things and get rid of them. And, most importantly, stop buying the kinds of stuff you wind up tossing. Free pens, mouse mats and mugs. Your hidden stash of takeaway menus. Unwanted Christmas presents that have hung around too long. Your plethora of novelty electronics. Boxes full of photographs that you, be honest, will never look at again. Rolled up posters hidden from view. Obsolete gizmos you keep lying around in case they’re ever worth something. Chargers and cables for obsolete gizmos you keep lying around in case they’re ever worth something. DIY materials, bought for an unfinished project several years ago. The amount of stuff we consume as a species is insane. ... 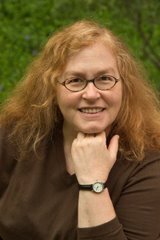 The environmental case is worthy of a whole other book, but I’ll put it simply: the earth’s finite resources are, well, finite – and if we continue to consume at our current rate, it won’t be long before they’re gone. To find real value in material things, it’s helpful to discover a deep appreciation of the things you use every day. Everyday things are the things that you use the most, so they’re the things truly worth investing in. Have hard-wearing shoes, comfortable chairs, knives and forks that won’t bend or rust. Have a computer that won’t crash or lose your work. Invest in your hobbies. Whatever it is you spend most of your time doing, have things that assist in making this better, all of the time. People with less than you. Charities who need the money. Schools. Libraries. People who need materials for experiments or making things. There's nothing new in this book — nothing you can’t read plenty of other places. But sometimes the way a person words a familiar concept makes it resonate in a way it didn’t resonate before. I'm not into resolutions, but I read two things recently about ways to approach time management in the new year that I wanted to share. Select something to stop doing this year. I don’t mean bad habits, such as injecting heroin or picking your nose; I mean something worthwhile, but that, if you’re honest, you don’t have time for.